In earlier articles, we described the introduction of the biofuels obligation scheme (BOS) in Ireland in 2010 and the subsequent introduction of regulations governing the sustainability of biofuels in 2012. In this article, we summarise some noteworthy developments since then. When the BOS was introduced in 2010, the obligation was 4%. This was increased to 6% in 2013. While there was a consultation published by the Department of Communications, Energy and Natural Resources (DCENR) in October 2015 on increasing the rate to 7% or 8% for the 2016 period, no increase was legislated for and so it remains at 6%. Notwithstanding this, the obligation is expected to increase to between 11% and 12% by 2020. A fundamental aspect of the BOS is that it is a certificate-based system in which a single BOS certificate represents one litre of biofuel. For sustainable biofuel produced from first generation feedstocks, i.e. vegetable oil, sugar or starch, one certificate is awarded for each litre placed on the market. Two BOS certificates per litre may be awarded for advanced biofuels, which are typically produced from wastes and residues. 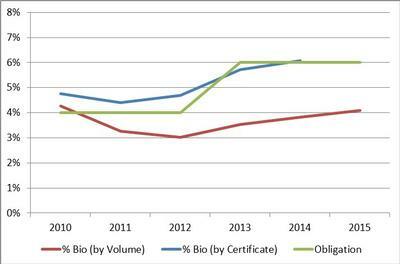 The obligated parties have relied on double certification to meet their biofuel obligations in previous years: in 2014, over 60% of the biofuel placed on the market received two BOS certificates per litre. The implication of counting advanced biofuel twice is that the volume of biofuel placed on the market is reduced – this is illustrated below. In 2014, to satisfy the biofuel obligation of 6%, 268 million BOS certificates were surrendered by obligated parties. This equated to approximately 167 million litres of biofuel, which was 4% of the road transport market, by volume. At present, there is a ceiling on the volume of biofuel that can be double counted. While there are many biodiesels that may be awarded two BOS certificates per litre, such as those produced from used cooking oil (UCO) and category 1 tallow, to date there has been no bioethanol placed on the market in Ireland which has been approved to receive two BOS certificates per litre. In common with all other EU Member States, biodiesel is the more prevalent biofuel in Ireland. It accounted for 69% of the biofuel placed on the market in 2014. UCO, which receives two BOS certificates per litre, is the most common feedstock for biodiesel and accounted for 62% of all Irish biodiesel. At the commencement of the BOS, it was envisaged that biofuels and electric vehicles would contribute to Ireland’s renewable energy targets. While biofuels were forecast to contribute considerably more than electric vehicles, with the DCENR recently revising downwards the number of electric vehicles forecast to be on the market in 2020, even more biofuel will be needed to compensate if Ireland's targets are to be achieved. Further information on the BOS can be found on the website of the National Oil Reserves Agency NORA.